War Eagle! We’re here to serve you on game day, or any other day. Our mobile locksmith service can typically be at your home or vehicle in as little as 30 minutes to quickly get your door unlocked at a low flat rate and without any damage to your property. In addition to lockout services, our Auburn locksmiths can also cut and program modern transponder keys, as well as many “dealer only” keys. We also offer residential lock re-key service. We have the skills and tools required to cut and program transponder keys to virtually all makes & models of vehicles. If you have lost your keys and are looking for a way to replace them, you’ve found it. With our on-site locksmith service, there is no need to have the vehicle towed to the dealership to pay exorbitant fees for what amounts to a simple task. As with most goods, the more hands a product passes through, the more markup is added on. With Unlock it For Me, you get access to low prices with no middle man mark up or retail charges. Don’t be fooled by the hype and marketing, the dealer is not the only place to get a replacement car key. It is most definitely not the cheapest. Just moved into a new property or the surrounding area? Our team of locksmiths can come to your property and re-key the locks to ensure you are the only key holder, and that all of your locks are functioning properly and in good condition. We can upgrade or replace damaged or worn hardware with more modern high-security locks to protect your loved ones and valuables. Have a lock that you don’t have a key to? We can fix that. Two keys to open your front door? We can correct that! We can key your locks so that you have 1 key that operates all the locks in your home, or your locks can be keyed differently to offer privacy or security in a certain area of the home while allowing ease of access for the family members. We also serve Loachapoka, Beauregard, Shorter, Notasulga, The Bottle, Salem, Maryrn, Tuskegee, Valley and Smiths Station with the same services mentioned above. We are willing to go the extra mile to provide excellent customer service in all our service areas. Unlock it for Me in Auburn, AL is the areas fastest and most affordable 24-hour emergency mobile locksmith service. Our talented team of locksmith professionals and experts are highly trained and skilled to get you back into your car. We understand the frustration of being locked out so we operate around the clock and will take your call at any time regardless of the hour. We are also available anytime during Auburn Sports Events with no extra charge! 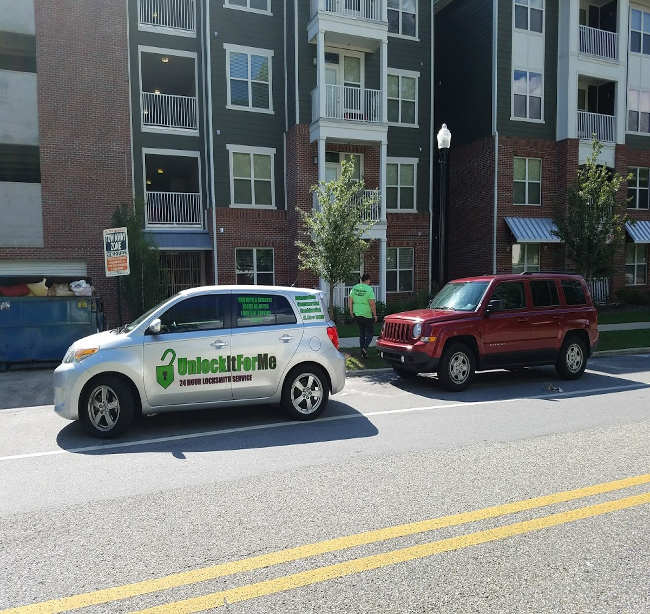 We can get to your location quickly because we are a local locksmith in Auburn, AL with friendly mobile locksmith technicians available to come directly to your location when you need us the most. Our mobile locksmith experts are fully licensed, bonded, and insured which means that you can have confidence in the quality and integrity of our skill, ability, and workmanship. All parts sold come with a 90-day warranty so you can be ensured continued peace of mind after the service is provided to you. If you have become locked out of your RV or Camper this can be a serious inconvenience! Especially at tailgate time! Our team of locksmiths in Auburn will respond to your location quickly to assess the situation, and shortly thereafter your door will be open and you can move on with your life! Wonderful! Locked out of a storage compartment? Broken Key? We can handle that too! Give us a call today! Outdoor recreation lovers will enjoy Auburn's 16 parks, which include Chewacla State Park (a 700-acre site in the Appalachian foothills), Kiesel Park (200 acres of meandering trails), and Lake Harding. Families can enjoy Hickory Dickory Park for picnicking and Family Fun Junction for miniature golf, batting cages, go-cart racing, and arcade games. The Donald E. Davis Arboretum showcases 150 different tree species native to Alabama and the Southeast. Auburn is also ringed by miles of multi-use trails and several lakes.